I keep saying I probably don’t need any more hand knitted jumpers, but I don’t seem to be able to stop myself knitting them… I’m averaging one per winter, so I suppose that rate of output isn’t too radical. And I gave my Lila Sweater to my sister earlier in the year because the alpaca blend yarn I used made me really itchy, so I had a space for a simple jumper in my wardrobe. Have I justified myself enough yet? 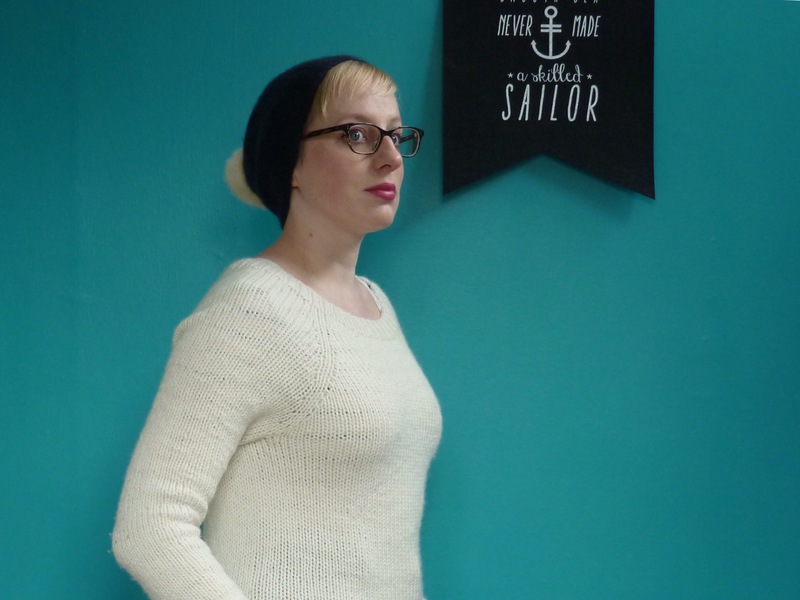 This is the Mossbank Sweater by Kerry Robb, published by Brooklyn Tweed. It’s a really simple pattern, but it has a lovely shape. I love the set in sleeves and the little bit of shaping through the front and back waist so that it isn’t just straight up and down. 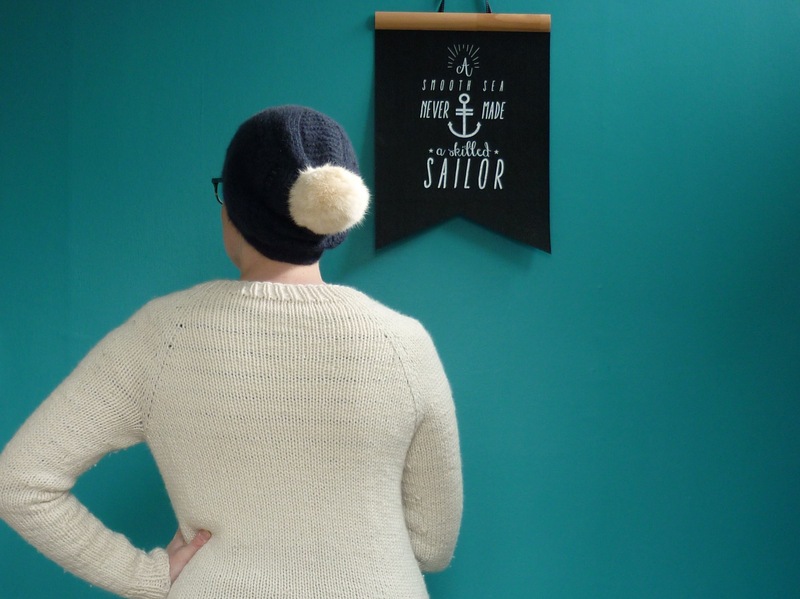 The sample is knitted using a marled yarn for the body with contrast bands and cuffs, and to be honest I bought it thinking that there was some special trick to knitting a marl sweater(any yes, I realise how stupid that sounds now!). I was pretty disappointed to realise that it was just knitted with a Brooklyn Tweed marled yarn! I can’t have been thinking clearly when I hit purchase… I decided to knit it anyway, because it’s the shape I prefer in my jumpers. I knitted this in my favourite yarn, Zealana Heron in Bottle Green. The dark green is beautiful, I’m so into dark green at the moment. I’ve waxed lyrical about this wool/possum blend before, I used it for my Bronwyn Sweater and also for the scarf I knitted Hamish for his birthday one year. It’s so soft and warm, I love it! It also works really well in the reverse stockinette stitch that the pattern calls for, the nubbly purl stitches and the slightly fuzzy yarn gives it a lovely texture. It also blooms wonderfully with wet-blocking, and just made everything look even and really nice. Something I’ve noticed with my older hand knit jumpers is that the neckband tends to stretch out over time, and I hate the way they sag at the nape of my neck. I’ve ripped back and re-knitted some of my older neckbands recently, and I’ve just done a basic rigid bind off instead of a special stretchy bind off. It seems to do a better job at stabilising the neck, and I haven’t had any trouble getting them over my head, so that’s what I did here instead of the tubular cast off recommended for the pattern. For further stability, I also hand sewed a length of Liberty bias tape (from The Fabric Store) along the shoulder seams and across the back neckline. I’m hopeful that this’ll help to stop any stretching, and I also think it looks really pretty! 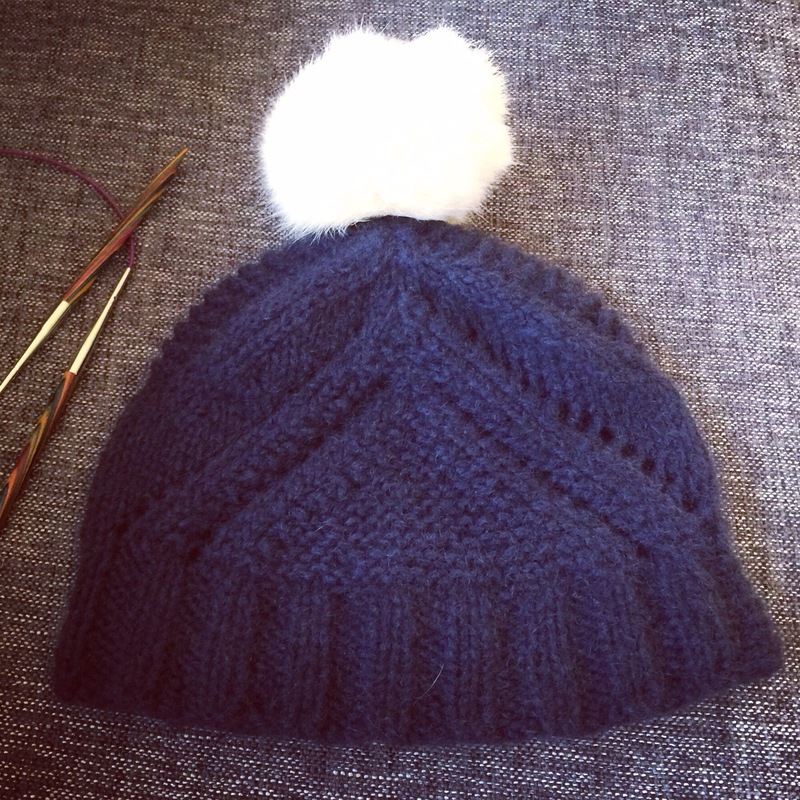 This is the Fidra Hat by Gudrun Johnson, knitted up in Zealana Air Chunky. Its been so long since I knitted it that that I can’t really remember how it went, but I don’t recall it causing me too much grief! This yarn is both the most expensive and the most luscious think I’ve ever knit with! Its a blend of cashmere, silk, and possum down, and it is the softest thing I have ever felt. I still have about half a ball left, so I’ll need to think of something fancy for it. I do love a big pom pom! This one is a faux fur number which I liberated from a keyring once I realised how expensive it would be to get a fur pom pom off Amazon or Etsy or similar (damn shipping rates). I love it, but it does pull the hat back on my head after a while. I think I must have overstretched the ribbing when I blocked it, and now it’s a bit big. I may give the ribbing a light steam, to see if I can shrink it back together a bit. The problem with using this wool for this pattern was that the gorgeous texture gets somewhat lost under the halo from the wool. A combination of knit, purl and eyelets form a double chevron pattern which is really pretty. If I was going to knit it again, I think I would use a smoother yarn with a tighter ply (is that the correct term? Something which is less loosely wound together) so that the different textures and patterns would really stand out. Next up is my first proper pair of socks. I say proper pair, as these are the first ones I’ve made in sock yarn which will actually fit inside a pair of shoes (unlike my actual first pair of socks). 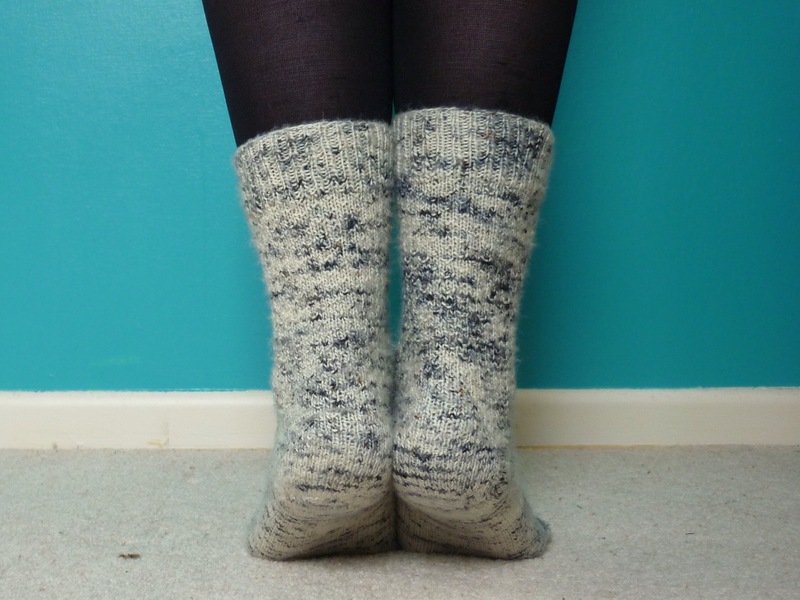 These are Hermione’s Everyday Socks, by Dreams in Fibre, a free cuff down pattern on Ravelry. I didn’t soley pick the pattern based on the name, but I do love all of her Harry Potter references in her patterns! The stitch pattern is actually the same as the Laule’a Socks, with offset purl stitches creating the texture amongst the stockinette stitches. I used the magic loop method to knit these, and found it much easier than using DPN’s, especially when lugging them around in my bag. My only real problem with these came when knitting the heel flap. I followed the instructions for the Eye of Partridge stitch pattern, and I’ve ended up with a nice sturdy layer with the floats and the back, but the front doesn’t look like the textured pattern that all the examples I looked at achieved! Maybe I didn’t pull my floats tight enough to make the slipped stitches pop out, I don’t know. Never mind! 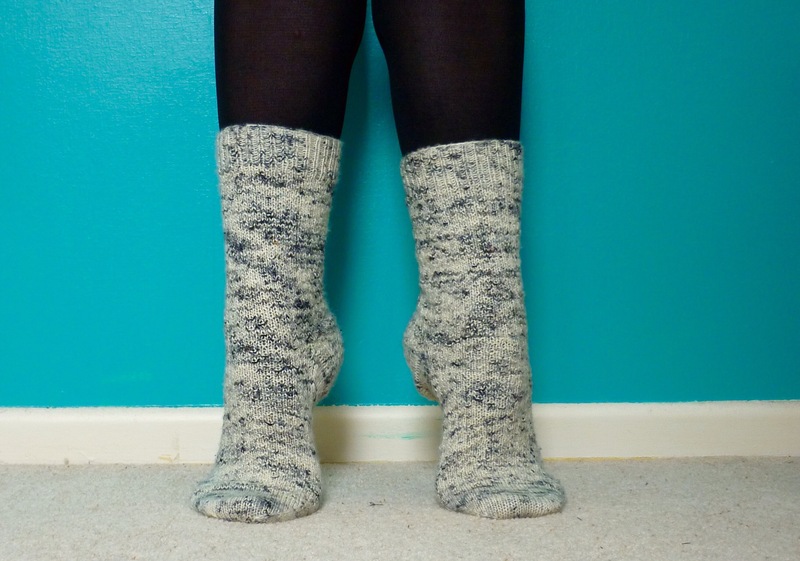 Knitting these was really fun, the stitch pattern is so easy to memorise and even the heel flap/gusset went smoothly. The only part I didn’t enjoy was the kitchener stitch to graft the toes, I hate kitchener stitch! I find it so unintuitive, I have to refer back to the instructions for every step (I use the tutorial on Purl Soho every time). The yarn I used is Madeline Tosh Sock, in the Optic colourway. I really like the tweedy look of the flecks of grey against the cream, it was fun to see how it looked as I knitted with it. I have another ball in the Night Hawk colourway which I’m looking forward to using! 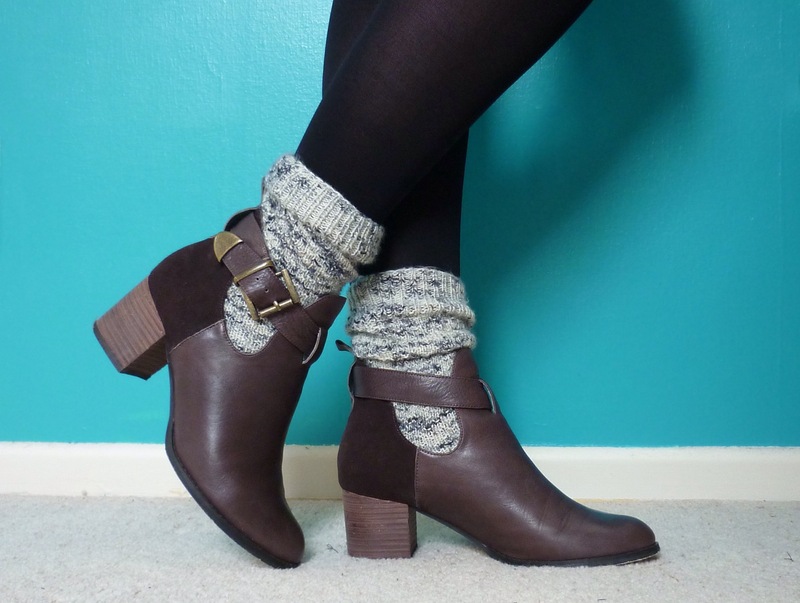 This seems to be how all the hipster girls I see around Wellington wear their chunky socks, but I’m not sure I can pull it off…They’re lovely and warm inside my knee high boots though!